This religious Rennaisance tapestry "Adoration" shows the work of master Renaissance painter Giotto di Bondone (1266-1337). His works are beautiful, and includes many pieces of religious and biblical content. In this work of is from his series of works of Christ, shows the adoration of the Christ child by the three wise men just after his birth. 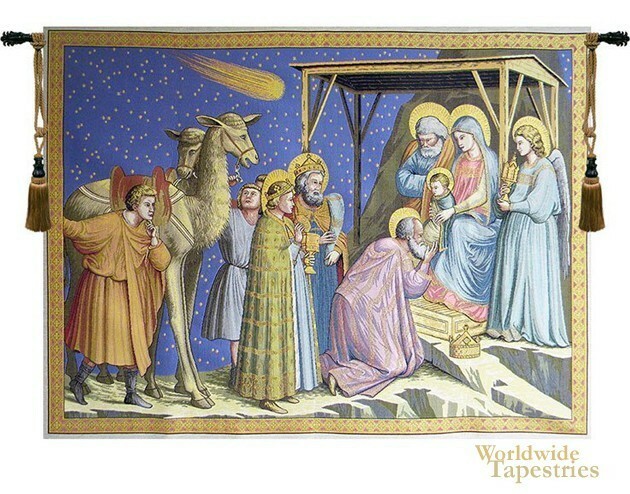 The star of Bethlehem is seen streaming through the sky, and the golden haloes surround the holy members of the Christ family, including the wise men and the archangel. Even the rocky ground is beautifully and stylishly rendered by Giotto. This religious Renaissance tapestry "Adoration" is lined and has a tunnel for easy hanging. Note: tapestry rod and tassels, where pictured, are purchased separately. Dimensions: W 50" x H 36"